Where can I download a table lamp accessory for MikuMikuDance? How can I make a table lamp accessory for use in MMD? I want to make a table lamp accessory. It is actually TWO models: On and Off! Switch the lamp Off and On for yourself! 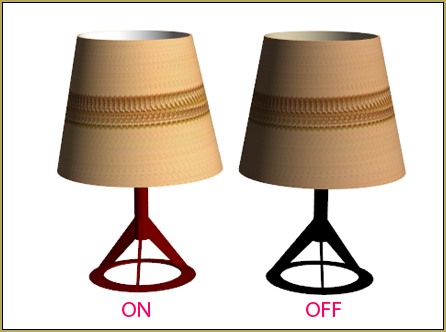 Download Reggie’s Table Lamp from the LearnMMD.com Downloads page. The lamp isn’t perfect because I could not lose that shadow inside and outside of the shade when the lamp is On. It’d be awesome if we could actually put a light-source inside that shade! (Also, it occurs to me that a power cord would be a good addition!) I got around that shadow issue by setting the camera so as not to see inside the shade when the lamp is On. I also adjusted the stage lighting, up and down, to brighten and darken the room as per the lamp’s on/off. In my animation, I used the standard floorlight01.x accessory … sized to fit my needs for the lamplight on the table. I actually used it twice, one on top of the other. The larger one set to be transparent for the diffused light shadow around the edge of the hard light of the table lamp.